Hi guys! Super quick post today- just wanted to do a round up of all my favorite cozy sweaters and liquid leggings as that has so been my uniform these past couple of weeks in these super cold temps! I just find this combo to be so comfy, but still so chic. Plus when the weather acts up (rain or snow) these are so fab as they kinda almost repel the water (versus soggy jeans!) The ones I am wearing in the pic from instagram are these (also shown below). Hope you are all having a good week so far! Mine is fab as I am feeling all sorts of motivated and energized for some reason. Happy Tuesday! Happy Thursday, friends! How are you guys? I am fab even though it has been a total and complete rainy mess here all week! If you know me, I DO NOT do rain. I am the biggest baby about it as it does nothing but ruin a good outfit and my hair (haha, so dramatic!) It’s supposed to clear out by tomorrow thank goodness! Today I am discussing my current love for all things high neck, high waisted and modern plaid. Three totally unrelated trends that I paired together in this look! Let’s start with this keyhole blouse (also here) from Tularosa. How fun? In these colder months when I am forced to wear jeans (I am such a dress, shorts + skirt girl), I am all about a feminine and cute top. The high neck trend is so fab because it’s easy to pull off + I think it really exudes some chicness. Most versions that are out right now have a fun keyhole (like this one) or plunge a bit, so it keeps it spicy! Hope you guys are all having a good week so far! And if you live in SoCal (or really anywhere in America) I hope you are staying warm and safe! One more day till the weekend! Woohoo! Hey hey it’s Friday!! Woohoo, we survived the first week back to reality (barely!) So I was trying to be so good and not drink all week (after the holiday madness), but ended up dinnering with some girls I love and had some wine last night…oops! But in all honesty, instead of going all health crazed like everyone else in January, I am just trying to live life to the fullest! Today is all about mixing navy and grey (and of course having a pop of fun with these most fabulous sparkly boots). I have always had a thing for the color navy as I think its a great change up from boring black. I love mixing it with black actually, but I also really loving combing it with grey tones. They just work really well together and have just the right amount of contrast. This moto, from BCBGeneration, is super luxe and so fun to pair with a tee/jeans, over a dress to edge it up or over a sweater/leggings. The navy gives it a more feminine feel which I love. For this look, I paired it with this gorgeous floral blouse from We are Kindred. I am love love the ruffle detailing on this top! So super feminine. You could wear this with a fun silver or navy pleated maxi skirt or a tan corduroy mini. I just loved how the colors popped with the navy suede. For denim, I went with these from Paige as I love the cropped + frayed hemline. Since the jeans are clearly made to show off shoes, I had to step up my game and went with these totally fabulous and amazing Saint Laurent booties. Ahhh you guys!! I am OBSESSED with these and honestly wear them all the time. When I first bought them my husband actually commented on how ridiculous they were and how I would so never wear them…well to his surprise (and honestly mine!) I have worn them probably 20 times since getting them! With jean skirts, with leggings, with tights and jean shorts and I even wore them on NYE with a star adorned mini dress + liquid leggings (it was raining or I would have obvie gone bare legged!) They are basically sold out, but there are so many similar options that I linked below. I promise if you get a pair you wont be disappointed in the wearability! For sunnies, I had to go with these from Miu Miu as they are perfectly grey and have another touch of sparkle. For bag, my small sac de jour from Saint Laurent was the perfect option. I just love this look as I feel like its so easy and wearable. To me, nothing beats a super feminine top, some great denim, a little pop of fun and an edgy jacket. Wishing you all the most fab first weekend in the new year! I hope it’s filled with fun and lots of living in the moment! We have a standard date night tonight at Bandera and then a double dater at a yummy Mexican spot tomorrow. Hi guys! Happy Wednesday! Anyone else TOTALLY struggling to get back in the groove of life post holidays? I swear my brain turned to total mush over the break. My birthday/NYE was a complete dream of a night with my college besties, but it was also the icing on the cake as far as being in total vacay mode. January is such a good time to reflect and reset, so I am going to try to get on that stat!! Today is all about my current love for anything (and everything) with stars as well as anything (and everything) furry. Two huge trends right now that I decided to combine in one look! 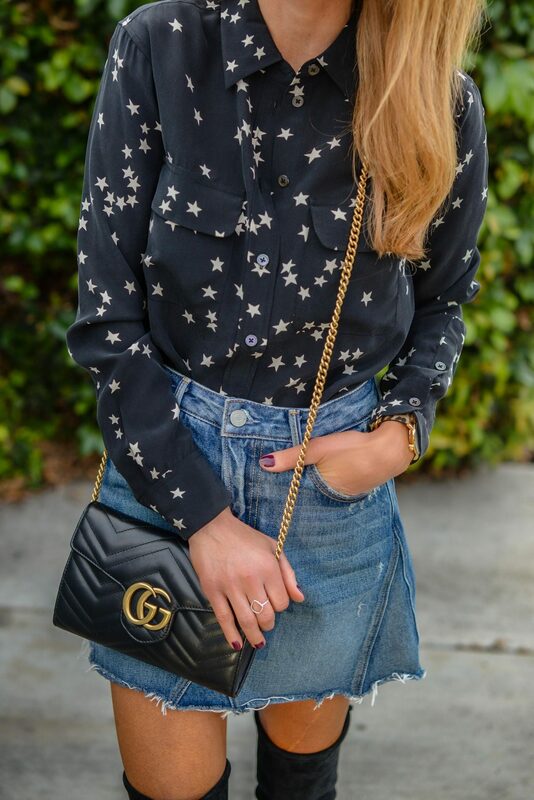 This starry button down from Equipment has been on heavy rotation lately as it’s just so cute and such a great, classic fit. I love the mini white stars (it comes in a white with black stars variation too) as they are just a perfect little pop of fun. I was at South Coast yesterday and saw literally 5 versions of this same shirt from different brands, so I will link those below as they are all different price points. Now onto this fun and super cozy furry jacket. This one is by Free People and is sadly sold out everywhere, but here and here are two super similar options. (Sidenote: I hate when items I fall in love with sell out before I even get to blog about them, but this one came out before the holidays so I think that killed it’s availability) I am so all about this fun burgundy color! I adore that you can wear it with black and brown and that it looks super good with both! Obviously this furry jacket thing is a big trend right now, but I really think it will stick around for a bit and I think it’s a great way to stay warm and look stylish. I paired these two fun pieces with my other most favorite item in closet right now, a denim skirt. You guys, I cannot stop wearing them!! This one in particular (that I have so already worn in a post (obsessed)) from Grlfrnd Denim is seriously just perfection!! The fit is kinda A-line which I love and it’s just a really great color/shape/style. There are so many others out right now, so I will include them in my links below. You can add tights for cooler days or pair them with boots like I did. I went with these from Stuart Weitzman, but any otk boot would look fab! I hope you are all having a good week and are having an easier time getting back in your groove than I am! Happy shopping!